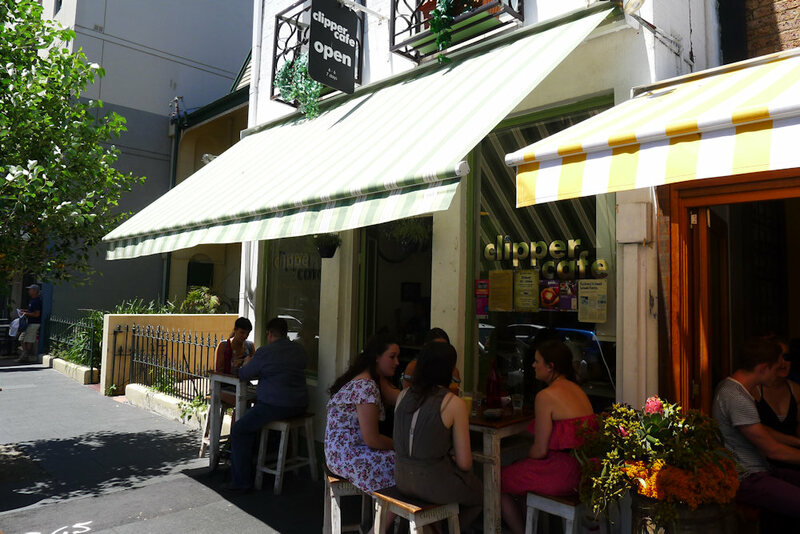 Clipper Café is a popular spot on Glebe Point Road. The awnings outside are cute and the décor is cool. The day we visited it was very busy, noisy and warm. There weren’t any tables available when we arrived but after a short wait we were ushered inside. There is an interesting range of choices available on the menu. Some that grabbed our attention included the toasted panini with King Island brie, prosciutto and mushrooms and the beetroot with Yarra Valley goat’s cheese, cucumber, cherry tomatoes and sherry vinaigrette. Our guest ordered a large latte ($3.50, small $3). It was a standard coffee with nothing memorable about it. 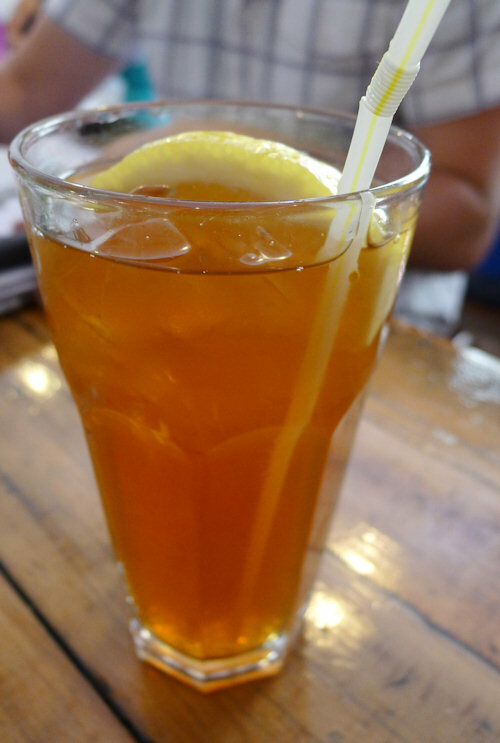 We also ordered a home made iced tea ($4.50). It is a refreshing twist to the standard cup of tea for the summer months. It contains black tea, lemon and ice however most of the ice had melted by the time it arrived. More ice and lemon would have made for a much more refreshing drink however it’s nice to see something different on the menu and we would happily order more. Clipper has a variety of freshly squeezed fruit juice mixes. They are all $5 and include delicious sounding combinations such as Detox (apple, orange, carrot and ginger) and Refresh (watermelon, ginger and lemon). 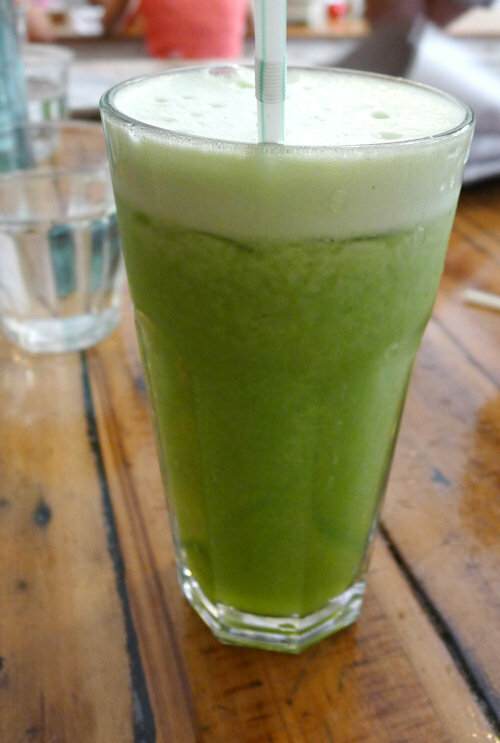 Dane chose the Delight which was an extremely tasty mix of pear and kiwi. Some more kiwi would have been nice as it was a bit hard to pin down its flavour. As you can see from the photo above, we received a generous and varied serving of fresh fruit salad with yoghurt and honey ($11). Although quite expensive, the fruit was fresh, ripe and well presented. We particularly liked the thin slices of pear which were soft when you bit into them. There was also a thin drizzling of honey over the fruit which added an extra layer of sweetness. If you prefer to add you own honey or yoghurt, order it on the side. There are two versions of the poached eggs on ciabatta ($12 each). The one we didn’t try is a vegetarian dish with roasted mushrooms, pesto and pecorino cheese. The prosciutto version that Dane tried tasted amazing. This is such a simple and obvious combination of great flavours – how could we have not tried this ourselves or seen it elsewhere? 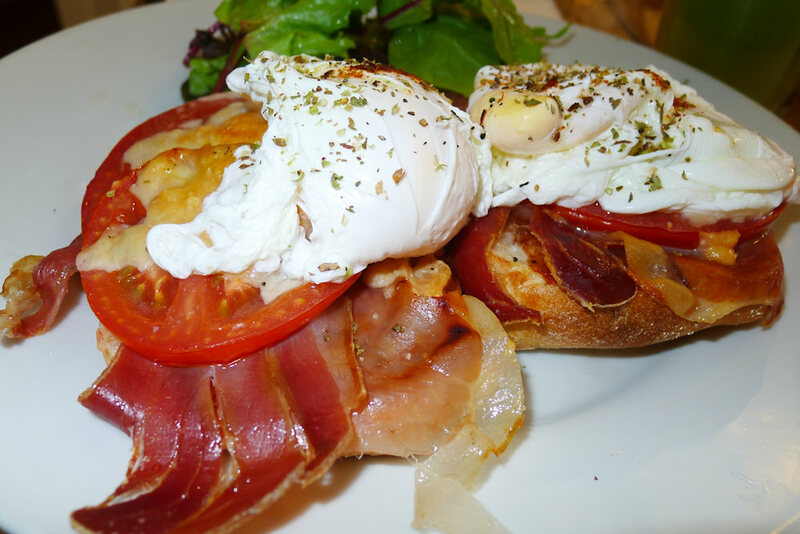 The cheese and prosciutto work very well together and the eggs had been prepared just right, the yolk delightfully soft and runny. Our guest was not impressed by the Clipper baked eggs with lamb sausages ($11). The tomato was overwhelming and the the ingredients were not in the ideal proportions. The bread was adequate but not fresh and delicious as you would expect from a trendy cafe in Sydney’s inner west. 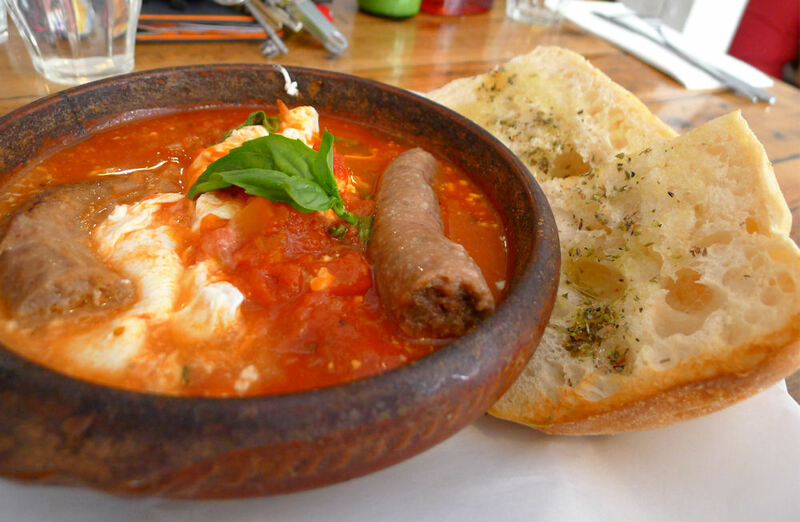 You can also order the baked eggs with roasted mushrooms or Italian chorizo, all the same price. 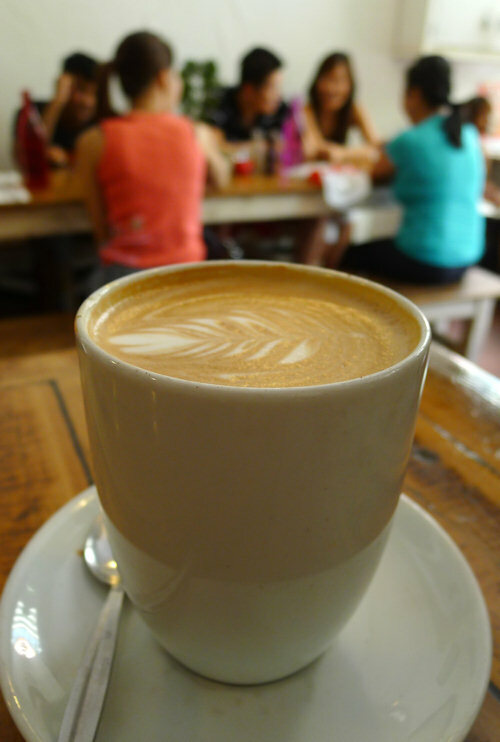 On Saturday mornings Glebe Point Road is bustling with shoppers from the markets and people looking for a good feed. We recommend a stop off at Clipper first them wandering around the markets for a bargain. In the summer bring your swimming costume for a swim at the Victoria Park Pool. It is an outdoor pool that caters for all the family. If you would prefer to avoid the heat, Broadway shopping centre just off Glebe Point Road houses a cinema complex, bookstores and green grocer. 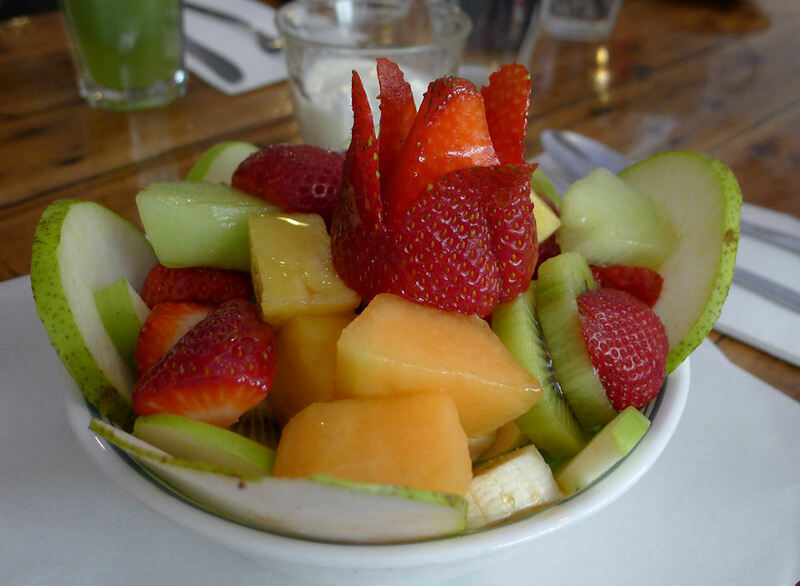 This entry was posted in Sydney - Inner West and tagged Fresh fruit and vegetable stores close by, Organic Options, Outdoor seating, Parking close by. Bookmark the permalink. Would love to see a ‘best of’ section.